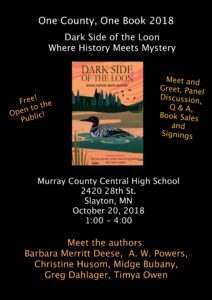 Dark Side of the Loon is Murray county's County Read. Join the Twin Cities Sisters in Crime for a Meet and Greet, Panel Discussion, and Book Signings! I’ve been a vendor at this event for a number of years and it’s one of my favorites. I surely do appreciate seeing people who are looking for my latest book. I'll be at the Boutique with my books. It's a great place to shop for Christmas gifts. I'm looking forward to our TRUE CRIMES panel with Twin Cities Sisters in Crime friends Judy Kerr, Michael Allan Mallory, Frank Weber, and Timya Owen. Come and hear where our stories come from. I'll join authors Marcia Adair, Barbara Deese, Judy Kerr, Sherry Roberts, and Timya Owen as we explore how historical events have inspired our writing, the challenges of researching our past, and how we walk a fine line when inserting fiction into actual historical events.